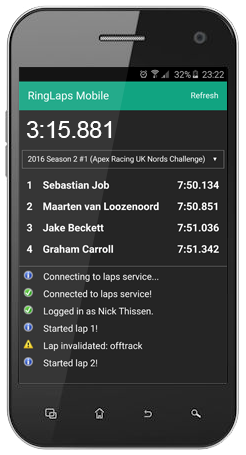 With RingLaps Mobile you can see the status of RingLaps on any device (smartphone, tablet, laptop) connected to the same network as your iRacing computer. Note: RingLaps Mobile does not time your laps, it merely displays the interface of RingLaps on another device. The regular RingLaps timer must still be running to time your laps. RingLaps Mobile displays most of the same information as the regular RingLaps timer, including your current running laptime, the list of available events, and the standings for the currently selected event. More importantly, it shows when your session is invalid for the selected event (e.g. due to invalid weather or track conditions). Finally, any messages are also shown so you can see important system messages, for example if your lap was invalidated or if your fixed setup is invalid. RingLaps Mobile does not require any additional applications. You must simply browse to the IP of your iRacing computer using the browser of any other device while the RingLaps timer application is running.